AMERICA’S GOT TALENT: Howie Doin’ on This Talent Show Contest? Los Angeles, Ca – “America’s Got Talent” wrapped it’s Los Angeles filming Saturday March 13th in downtown Los Angeles at The Orpheum Theater. The big question this season is not does America have talent, but, how is Howie Mandel doing as a judge taking over David Hasselhoff’s chair? Mandel made his entrance as a game show host with NBC’s glam and showy, “Deal or No Deal”. His next venture was his hidden-camera show,”Howie Do It”. But, a judge on a talent contest show? I was apprehensive. So, I had to see for myself. I really couldn’t imagine anyone living-up to the very opinionated and quirky Hasselhoff. About a half-hour into the show, I was right. Mandel does not live-up to Hasselhoff, but surpasses him. David who? Hassel what? Mandel is very vocal in his judging and observations of talent acts. He counter-balances other male judge, Piers Morgan, on opposite end of the judging table perfectly. At the start of the show, the judges are introduced one-by-one as they strut-out onto an open pathway among audience seating. Mandel, the last to be introduced, has a great presence and seemed to fit right-into that setting. As the acts came-out. Mandel proved to give valid critiques and provided some very quick witted humor in a more sophisticated manner than Hasselhoff. Mandel’s comedic background came in very handy when a young comedian contestant came onto the stage. He told the young man that comedy is very difficult. And to make an impression on the judges and the audience in 90 seconds, “is extremely tough.” He gave another contestant much needed advice when he stated that the contestant should really “focus” on one skill, or talent. Mandel was also taken with some of the female contestants, similar to how Hasselhoff would react. While Morgan is striking his “X” to get non-talented acts off the stage right away no matter what they look like, Mandel is holding-off in order to see their full act for the sake of SEEING it. Well, he was surrounded by some of the most beautiful women in game show history on DEAL OR NO DEAL for four years. It appears he misses that part of his game show past. Some of the acts that came in front of the judges included: a male belly-dancer, a Bollywood dance troupe, a sumo wrestling act, a singer pulled from her Father/Mother/Uncle act, and more will be revealed on this site in the next month along with video interviews from Los Angeles contestant auditions and audience comments on what they thought of Mandel and this season so far. 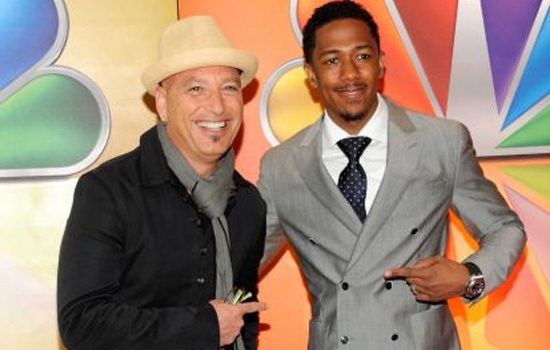 Host Nick Cannon returns and spent much of his time backstage interviewing contestants. The only time he appeared on stage was to play around with a contestant’s music instrumental contraption. “America’s Got Talent” is hitting Portland, Oregon next for audition filming. The show’s two hour premier will air Tuesday June 1st (8-10pm ET) followed by a Wednesday edition debut June 2nd (9-10pm ET) on NBC.